My mother recently turned to me, looking thoughtful, and asked "do you ever feel out-of-place in groups of non-unschoolers?" My sister and I had just come back from a party, and it seemed to occur to her that she'd never asked that question before. Slightly startled, I thought about it for a moment, and replied "not really. Not if I have something else in common with the group, at least." That question got me thinking, though, as I feel it deserves a longer and more thoughtful answer. As a child, I always felt out-of-place in schooled groups. But then again, I frequently felt out-of-place in homeschooling groups as well, seeing as the only ones around when I was young were highly religious, conservative, and not so into unschooling or even relaxed homeschooling. I was (and hey, still am) shy, and it took me a while to find groups I really felt good being a part of. The first groups I did feel comfortable in were unschooling ones, in my teens, once I started going to events like conferences and Not Back to School Camp. But as an adult, it's different. And in the years since I started hanging out with unschoolers, I've frequently felt like I belonged quite well in various groups, both unschooling and not! As with anyone, all it really takes is having something (or multiple somethings) in common with the group you're in. If you have a shared identity, interests in common, if you understand the social expectations of the particular community or type of group you find yourself in, you'll probably feel pretty comfortable. If you don't, well, then maybe you won't feel so at home. That party I'd just come back from, when my mother decided to ask that question, was made up almost entirely of 20-something queers. I identify as queer, and I know the language and vocabulary of social justice, the terminology most often used to discuss sexuality and gender, and share the same hippie-ness often found in such communities. That's the type of group I'll happily end up in conversations with multiple people, and won't be likely to feel out of place at all, even though most people there currently are or recently were students. I don't deliberately bring it up, but sometimes my lack-of-schooling still manages to make it's way into the conversation ("You said you're a writer, where do you write?" "Blogging, mostly, a few articles in a couple of magazines..." "Cool! What do you write about?" "Alternative education, mostly." "How did you get interested in that?" "Well, I didn't go to school..."). In this particular case the subject did come up at one point in the evening, which led to one person mentioning they went to an alternative elementary school and another one commenting how the linear way things are taught in schools doesn't actually fit the way most people learn. Perhaps the reason I feel so comfortable in the groups I most often find myself in is because the communities I've gravitated to are all "non-mainstream." Not just the unschooling community, but the queer community, politically radical communities, general hippie/organic farming/contra-dancing type crowds. Communities that both have a lot of overlap with each other, and also tend to be very unschool friendly. That doesn't mean I don't still get stupid questions sometimes, but it does mean that unless someone goes out of their way to ask inappropriate questions or make me feel othered, I'll probably feel like I fit in pretty well. And when I DO feel out-of-place, as does inevitably happen sometimes (whether it's because the group at an event I went to wasn't the type of group I thought it would be, or I venture out of my regular type communities to go to some band party of my sister's), while it's sometimes because of unschooling, it's as often as not because I feel like I'm the queerest person there, or because I'm dressed "strangely" compared to those around me, or a combination of all of those things. It's virtually always more complicated than just "I'm the only unschooler here, wow I feel left out!" Which kind of begs the question, how much does unschooling affect you? How much has unschooling affected me? I feel like unschooling has definitely had a huge impact on my life, as the very existence of this blog kind of shows. I feel that being an unschooler is an important part of my identity. But, so are many other things. I think unschooling has shaped the way I look at things. But, so have plenty of other experiences in my life. Not going to school has definitely affected the way I relate to people, but I don't really think it's made it harder to relate to people (or at least, no more so than any of my other identities). I'm just never quite sure how much credit to give to unschooling, how much of me was and is shaped by having not gone to school and how much would have been me no matter the educational experience I had. My opinion on the matter changes fairly frequently. Sometimes I have felt that other people are setting me apart because of my education, sometimes I feel unschooling makes a bigger mark on people than other times. Who knows. All I do know is that it's important to me, but it's far from the only important element or experience in my life. And most of the time at least, it's not something that makes me feel out-of-place! I'm always really interested in how other adult unschoolers feel about this. 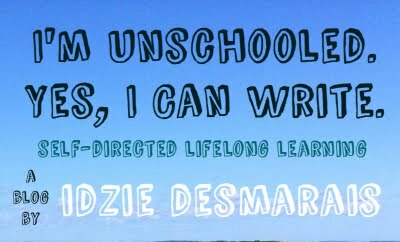 Do you feel unschooling has set you apart? Changed the way you relate to people? Is it an important part of your identity? I'd love to hear your thoughts! Ooh, a many-layered question to which I probably have many different answers. Like you, I grew up in an area where the not-in-school kids were most likely pretty structured, religiously-motivated homeschoolers. They didn't feel like "my" people at all. I've always been a loner (my wife too; we joke about how we'd probably freak out if we were ever in a room with "our" people because it would feel really weird). I tend to make really intense one-to-one friendships, and those (over my lifetime) have been perhaps equally non-schooled and traditionally-schooled kids. It mattered less as a child (I was less aware of it) and also more (I was way more visibly different when my peers were in school. These says, unless I "come out" as an unschooled person, no one has any way of knowing about that part of my history. Like you, I gravitate toward counterculture groups and people, but the alternative education thing has become more part of a holistic realm of ideas and activities rather than a central part of my identity. At the same time, I'd say who I am today is profoundly influenced by my growing up not in school. And I also think it's not a coincidence that my wife is also a grown homeschooler. There's part of her that "gets" that home-centered childhood in a way that a partner who had never experienced it would not, and that makes her read as "home" to me in a very core-identity sort of way. I'm not sure I would feel the same level of deep affinity for someone who hadn't shared that experience ... even though our lived homeschooled childhoods were very different in many ways. I certainly don't feel like my awkwardness, to the extent that I have social awkwardness, can be directly traced back to "homeschooling" as s fatal flaw or fatal difference -- the One Thing that causes me to be "weird" in the world. There's the queerness, the introversion, the willingness to just go my own way and damn what other people think or say, the feminism, the socialism... probably all of these aspects of my personality were informed by home education (and more importantly the values that prompted my parents to pursue it) but I'm not who I am "because of" homeschooling. I am who I am because of me, and also because of the way of life my parents created for their (my) family during my formative years.